Alex, Charlie and I had Annual passports at Disneyland this year. 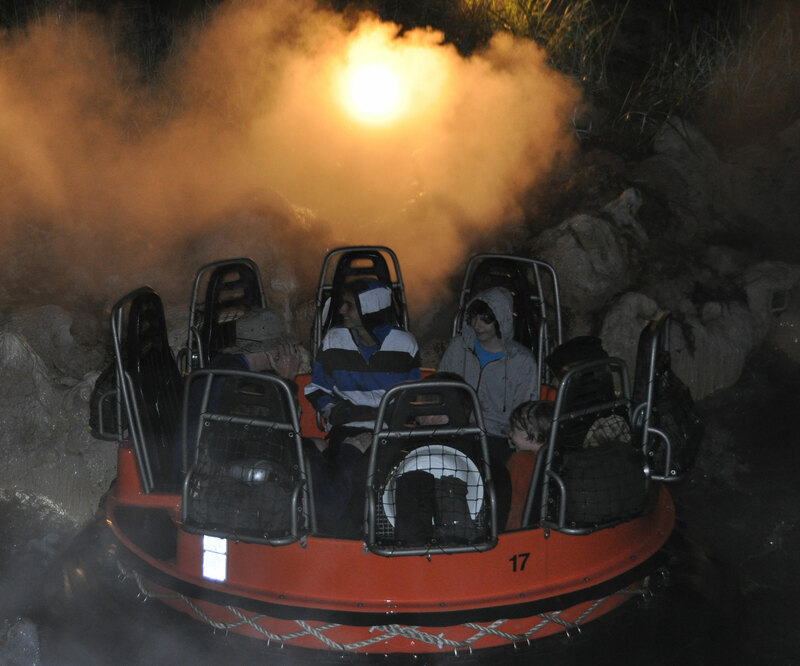 Here are the boys on a late evening water ride, the Grizzly River Run, in April. You know that you’re getting old when the McCartney featured in the Queen’s New Year’s honors list is named Stella. Stella? Oh, that’s right, Sir Paul’s daughter, honored for services to British fashion, notably for designing the uniform of GB’s Olympic athletes. It has been 48 years since mum and dad took Sue and me to see John, Paul, George and Ringo singing “I wanna hold your hand” at the Hammersmith Odeon in London on Boxing Day. It has been 29 years since dad died, and 16 years since mum. I turned 60 this year, just to rub it in! But that milestone passed at Disneyland without undue stress. Antony, Sue’s son, brought his delightful crew up to share the weekend with some of my delightful crew, and made my day by announcing that 60 was the new 37. He himself is 37 and full of vim: everyone needs a nephew like Antony! 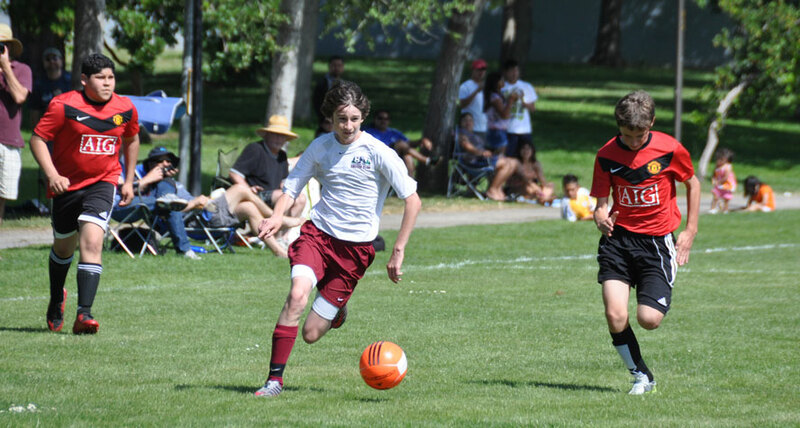 Alex running through for the Thunder, who won the local league and District Cup this fall. Alex was a key component of his team. The children too are getting older. Only two are at my place regularly: Charlie (17) and Alex (15 this month). Alex’s friends are his life’s priority, of course, and most weekends he or one of them will host a sleepover. Sometimes a group of them will “adventure” during the course of one of these sleepovers. I’m not entirely sure what adventuring is in this context, but it frequently seems to involve substantial amounts of toilet paper, draped outside a friend’s house or a neighboring girl’s house! 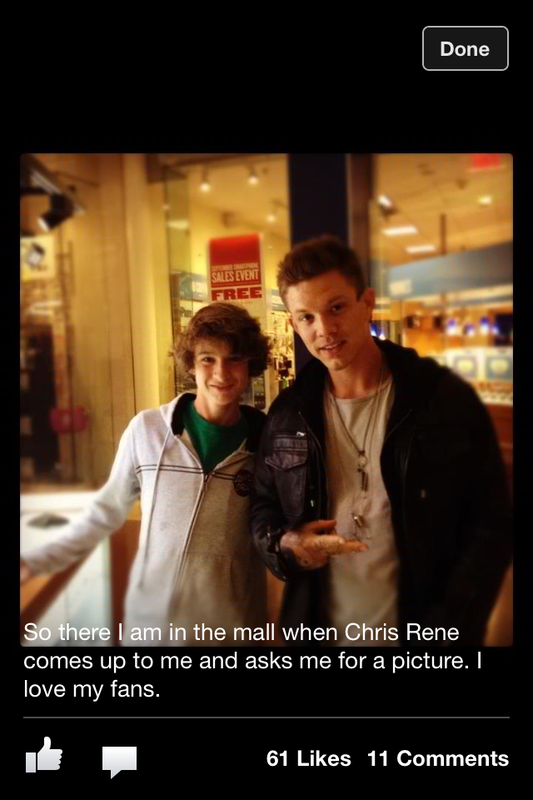 Chris Rene is a local celebrity, having placed third in X-Factor, Simon Cowell’s new TV show. Alex ran across him in the local mall, and posted this on FaceBook with his own caption: check it out!! Even when he is sitting next to me in my condo, he spends much of the time in his own world, playing FIFA 2013 on the X-box and chatting over the headset with his friends. They are playing online soccer with him simultaneously in their respective homes, buying and selling players like professional team managers building their own teams. Alex’s X-box team features players from the German Bundesliga, with a focus on Borussia Dortmund. He has discovered that players from there are cheaper to buy than players in the English, Italian and Spanish leagues, but with comparable skill levels. For Christmas, he wanted a high definition video game recorder, so that he and his friends could build videos of matches or show online great goals from their own games. Teenage entertainment has improved exponentially since I was that age. Charlie dribbling for his varsity soccer team, the Falcons. Charlie also spends a fair amount of time at my place, but often when I’m not home: I wonder why! He invites groups of uncouth boys over to my condo after school, with an occasional pair of girls (they always seem to arrive in pairs! ), for pow-wows and bad music. After one of these afternoon group visits, I found seven half-drunk bottles of water in Alex’s bedroom, and chocolate wrappers and assorted other detritus dotted around the condo. I left Charlie a note the next day, prominently placed in in the middle of the floor next to the front door, where he couldn’t help but see it. It asked him to clean up his mess. Returning home, I found the condo in much better condition, but for a ball of paper crumpled up right in the middle of the floor next to the front door. You guessed it: my note!! That awesome liberator of adolescents and terror of their parents, a car. This is Charlie’s third. His first, a Honda, was written off in November 2011, just two short weeks after it was acquired, by a tree which fell on it in a storm. The second, a Toyota, lasted a little longer before a deer ran into the road in front of him one night and froze. Charlie avoided the deer, at the cost of hitting the fence on the side of the road. One of the two-by-fours in the fence came through the windshield and hit his shoulder, located very close to his head! As I said, the terror of parents. Adolescence continued throughout the year. I received one of those phone calls that a father hopes will not happen to him. The mother of one of Charlie’s pretty sixteen year-old blond friends called to share what had happened the previous night at her family’s condo. There was something about how her daughter had gone to bed, something different, that had made her and her husband suspicious. They decided that the husband would sleep in the sister’s bedroom – the sister is away at college – which is next to the daughter’s bedroom, downstairs in their condo. The sister’s bedroom has French doors out on to the terrace, accessible from the street by climbing over a fence. Around three in the morning, a loud knocking woke him up, and in his daughter’s room something stirred. She tiptoed into the room where he was sleeping and was heading for the French windows when he announced his presence, to general consternation. He instead of his daughter opened the French windows, and there was Charlie! They had made arrangements to see each other later, she had fallen asleep waiting for the appointed hour, and Charlie had not yet learned that discretion is the better part of valor, or to put it another way that if she falls asleep, game over! Brotherly love! This was at Nick’s birthday lunch at the local Chili’s, which he chose in order to please his kid brothers. They love the place! Charlie lent a hand when Alex did not feel like smiling for the camera. I saw very little of Daphné (25) or Alban (23) this year. She spent the whole year in Tahoe, and I saw her only once when, unannounced, I stopped by the resort where she was working. That visit went well, but only lasted ten minutes! I saw Alban a few times, briefly with one or other of his siblings, and caught glimpses of him sitting at the kitchen counter in his mom’s house when I drove up the driveway to drop Alex off. That used to be our house, the family home, and will shortly be for sale. I’m rarely allowed in, and Alban lived there all year. He and Daphné have become part of the larger divorce, dropping out of my life just as the house has. Children growing away as they grow older feels sad, even as it is inevitable: children growing further away because of a divorce feels worse. With my boy on top of the Jacobite Memorial, at Glenfinnan, where Bonnie Prince Charlie came ashore. The Glenfinnan Viaduct is over my shoulder. At the same time, I’ve been closer to Nick (26) and Tom (23), even though they have both been living in Paris. Tom spent the whole year there, but I did see him for a few days in the UK this summer. Calling from the US, I was explaining to him over the phone why I would not be able to spend much of my short vacation with him. “Yes, of course we’ll go to the funeral together (the funeral was a memorial service for Aunty Vi, evoked here), but I’ll be busy before that, spending a couple of days in Scotland, and . . .”. “I’ve never been to Scotland!” he exclaimed, interrupting my perfectly reasonable explanations with a rush of youthful energy. Ding! He had me there. It hadn’t even occurred to me that he might be interested in Scotland. But if he was, well, great! I found myself on the Caledonian Sleeper train heading from London to Fort William in the northwest Highlands with Tom. 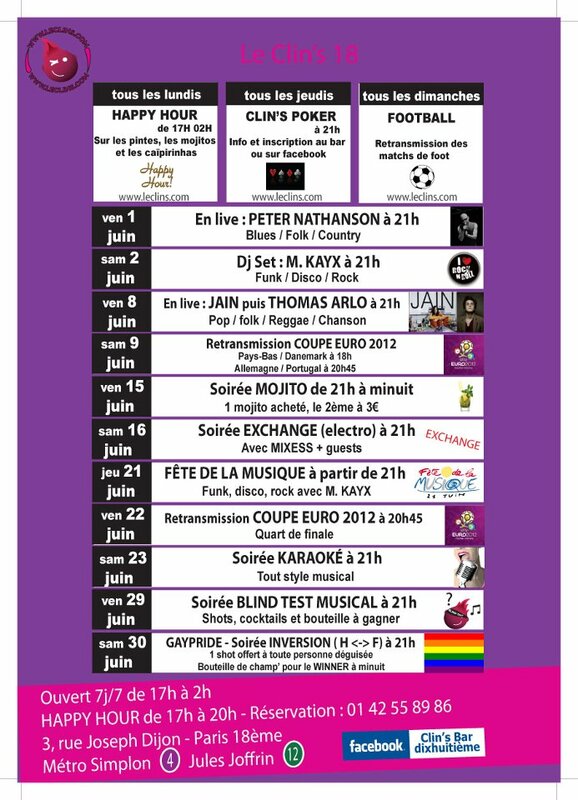 Tom (Thomas Arlo) on a list of concerts at Clin’s Bar, a Paris venue. Go for it, kiddo! Unfortunately, ScotRail did not have a sleeping compartment for him, which meant that he was obliged to travel twelve hours in a seat. Itself, that wouldn’t have been so bad, but there no through seats, and Tom had to change carriages in Edinburgh. He was not entirely happy with this turn of events. It resulted in him taking a stroll on Edinburgh Waverly station at about three in the morning, while ScotRail separated our train into its three separate destinations and hooked a seating car up to our sleeping cars destined for Fort William. But the stroll worked out fine. I was still sufficiently jet-lagged to be wide awake at three on a crisp Scottish morning (11 am in California), and walked with him up the platform and over the pedestrian bridge to an informal “smokers corner,” where he lit up. 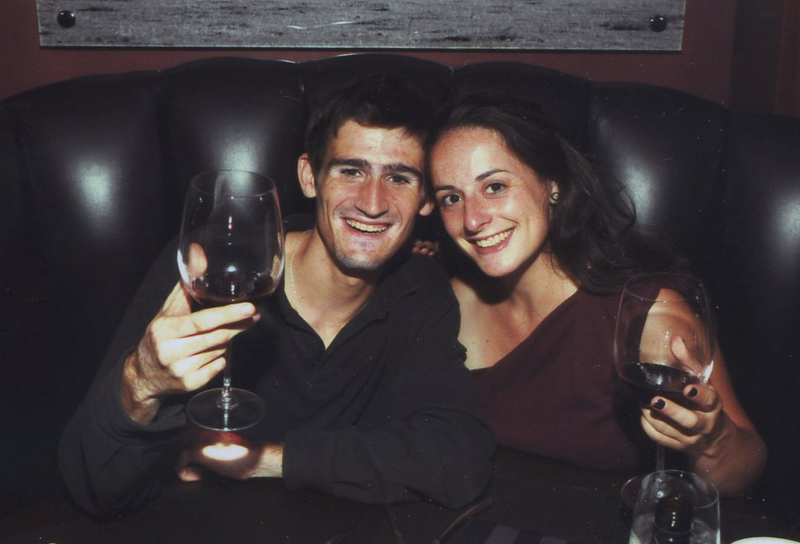 Singing in a French jazz cabaret on weekends, his body clock was almost as out of sync as mine: he got to the cabaret around 9 or 10 pm for dinner, performed for an hour at, say, around midnight or 1 am, and then hung out at the bar until 3 or 4 am. This overnight train trip was right on his schedule! Glenfinnan Viaduct, with the Hogwarts Express at speed. The train is called the Jacobite in real life, after the rebellion. That’s right, you can’t find platform 9-1/2 at Kings Cross Station in London, but you can wonder at this scene from the Harry Potter films! Tom has found some “very able” musicians who like what he’s doing and want to record demos with him. This encourages him, although finding the money to rent the recording studio remains a challenge. He says that he is focusing more on his lyrics these days, to complement the melodies that he now seems to find readily accessible. He’s being offered occasional paying gigs, like the cabaret, to supplement the “open mike” evenings he regularly plays in local pubs. It’s a hard life in many ways, but not all. After visiting the Scottish Highlands with me, he was flying to Crete, to visit his mom’s relatives there, and on to Romania, to visit his girlfriend and her family. Not a bad month of August for a struggling musician! Nick came back from visiting his girlfriend Charlotte in Paris in February, and left again for Paris with her in September. The latter was supposed to be a two-month vacation, but turned into his admission into a Parisian university, the CNAM, for people like him who have already learned a trade, as well as a decently paid long-term part-time job. I was delighted for him, even though it meant that I was again living alone. Living and working with a grown-up Nick had been one of the highlights of the last year. Nick and Charlotte visiting Las Vegas during her stay in California. This was taken by the Luxor. Needless to say, they had a great time, and spent way too much! Finally, the hearing for the divorce took place in late October, and the judgment is expected shortly. As Jeremy asked, “who still goes to court in a divorce?” Nobody!! But Marie-Hélène refused to sell the house or buy me out, which is what has to be done to separate our community property into two, until the judge ordered it. The hearing did mark a transition of sorts. I’d been locked up inside myself somehow since moving out in April 2010, and all of a sudden wasn’t anymore. Along came Kaira! Dating is pretty intense when you haven’t done it with a new person for 20 years: also pretty fun! 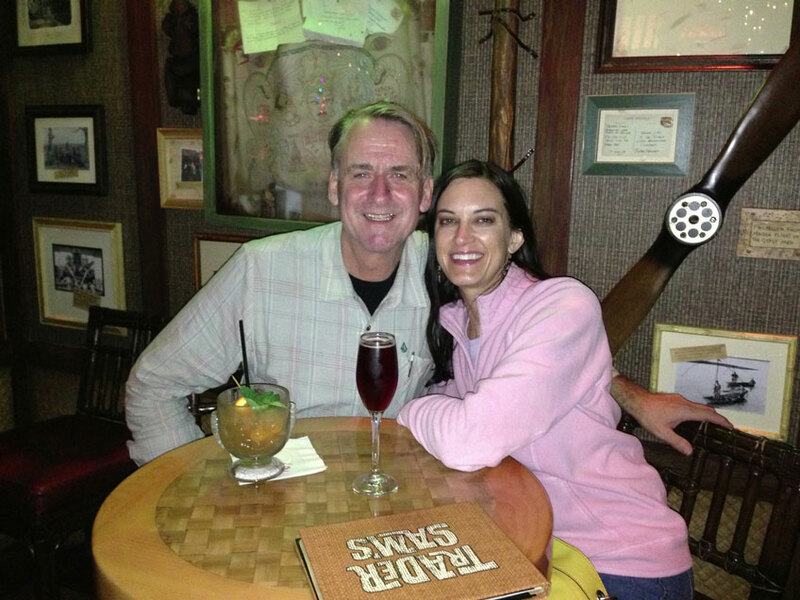 With Kaira at Trader Sam’s on the pool terrace of the Disneyland Hotel. Happy birthday to me!! It’s been a fun year all around. I finally allowed the US medical establishment to have its way with me. A little. Since turning 50, various doctors have been badgering me to have a colonoscopy. This is a test for bowel cancer which is very effective, apparently, and is the only way to identify this prevalent type of cancer. All Americans over 50 are advised to have one done on a regular basis. It is an outpatient procedure, involving the insertion where the sun don’t shine of a tube incorporating a camera. The doctor searches for cancerous growths through this lens, which is quite fascinating of you stop to think about it. Don’t!! Father’s day, with Nick, Charlie and Alex. I was grateful to share at least a portion of the day with three out of the six. We were watching Euro 2012 together. Soccer again. A nurse specializing in the domain offered a preparatory consultation. Her name was Acelina, an unusual name which just happens to rhyme with Vaselina! I was trying not to laugh at this odd coincidence as she chatted on, explaining the procedure in a friendly and unembarrassed way. Then she announced that however tall or short you are, however big or small, your intestines are about twelve foot long. “That’s interesting,” I reflected, before asking my happy nurse how long the tube was. “Twelve feet” was her prompt reply. “That’s that then,” I thought to myself, and put the whole thing off for three or four more years. The consultation with Acelina occurred in 2009. I finally went ahead this year, at the urging of my kind and caring doctor, and am happy to report that there was no news and will be no photo! !